A 65' passenger ferry catamaran built in African plywood and epoxy. This 65' passenger ferry catamaran design is designed to carry150 passengers on Lake Victoria . The very efficient hulls take relatively little power and generate very little wake. 500 hp per side gives 31 knots speed. As with the earlier 85' ferry project, I wondered why a ferry could not be built locally in Africa with local plywood and epoxy instead of alloy or fiberglass from Europe? That would be less expensive and very long lived. 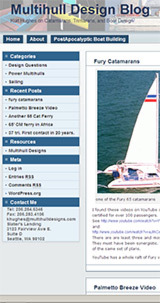 My first USCG certified catamaran design was built of plywood/epoxy in 1984 and still operates every day in Kona, Hawaii. This operation would not only remove the large dollar cash transfer from developing countries to industrialized ones, but it would create a local skill- set that would allow future vessels to be built the same way. Only the epoxy, sheathing fiberglass and machinery would need to be imported. It turned out that visionary and entrepreneur Rob Smith of the Agapos Foundation, among organizations, felt the same way. We are colaborating on this catamaran for Lake Victoria. Unit #1 is being built here near Seattle. The remainder of the vessels will be built in Uganda. The design could and would conform to classing society rules and thus could be easily insured. In appearance and function, it would be identical to a plastic or metal one built here or in Europe. I see my role as not only designing the vessels, but also assisting in design of the process to build them. I am by now, expert in both fiberglass and plywood/epoxy vessel design and construction. Furthermore, I do considerable US Coast Guard certified vessel design. This design could take advantage of my experience in a unique fusion of skills. The design is evolving, and will be updated from these early images. For example the design used to have balsa core, but will now use plywood "eggcrate" grids instead, as shown below on the bridgedeck component. Unit #1 ended up with revisions that will put her down on her lines, but I intend to be more involved with the latter units.